The impressive Romanesque church that you see reflects both the prosperity of Detroit’s Catholic residents at the beginning of the Twentieth Century and the entrepreneurial skills of the first pastor of this parish. In 1906, Bishop Foley established a new parish that would include a rather empty but rapidly growing section of Detroit, bounded roughly by Charlevoix, the Detroit River, Fisher Avenue and Fox Creek near the city’s limit. Joseph Stapleton was chosen to organize the parish and Annunciation was selected as the name. The Annunciation is described in verses 26 to 38 in the first chapter of Luke’s Gospel. Luke tells us that God sent the Angel Gabriel to visit Mary in Nazareth to tell her that she would become the mother of Jesus. The Annunciation has been a celebrated feast in the Roman church since, perhaps, the Council of Ephesus held in 431. Father Joseph Stapleton first said Masses for his few congregants in local homes and then purchased a Protestant Church that had gone out of business. Catholics moved into this area of Detroit in great numbers, so Father Stapleton successfully raised funds for a large complex of buildings, including a church, a rectory for the priests, a substantial school and a convent for the nuns. 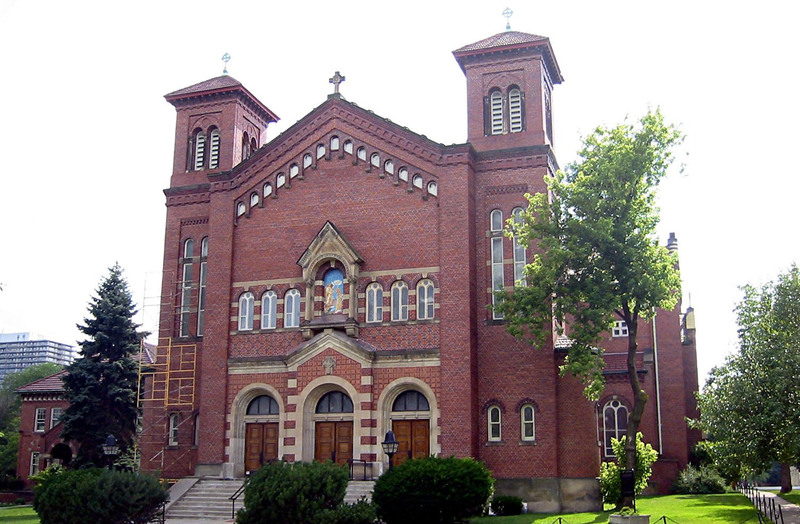 John Donaldson and Henry J. Meier were very active in designing buildings for the Roman Catholic diocese in metropolitan Detroit at this time so their distinguished churches and affiliated buildings are found throughout the city. For Annunciation, they choose the Romanesque style and executed it with precision. Note the attractive brickwork at the entrance. This is an appealing church, but also a large and dominating one. Indeed, there are many Catholic dioceses in the United States with cathedrals more humble than this imposing east side church. Catholicism flourished in the city of Detroit from its funding by Antoine Cadillac in 1701 to the mid-Twentieth Century. For a variety of reasons, immigrants tend to be more active participants in their religion in their countries of destination than in their countries of origin. This parish, however, probably attracted many second-generation immigrants who were able to afford homes in this relatively affluent Detroit neighborhood. It was not an ethnic parish where the priests and nuns were expected to communicate in one or several European languages. It was, as the buildings demonstrate, a large and prosperous parish. During the 1920s, its membership may have exceeded 5,000 and, at its peak, the parochial school enrolled 1,700 children. Father Stapleton received numerous honors for his successful service at this parish and continued as its leader until his death in 1942 at age 74. By the 1960s, some Catholics moved away and those who remained tended to be older. In 1968, a well-known Detroit Catholic activist —Monsignor Wilbur Suedkamp—was appointed to pastor this parish. His reputation came from his dedication to providing housing for the elderly poor in the post-World War II era. Poverty among the elderly was, as recently as fifty years ago, a serious and troubling issue. Social Security covered many fewer people than at present and was not indexed for inflation. Generous retirement payments from employers were rare, so many older individuals faced bleak prospects when they reached their mandatory retirement ages. Federal housing policies built large complexes, but they were primarily for younger families such as the Brewster Homes for blacks on the east side of downtown Detroit and the Jefferies Homes for whites on the west side. Father Suedkamp, in the early 1950s, led the Catholic diocese to become actively involved in establishing senior residences where the elderly could live securely in dignity. He was highly successful in raising funds for these residences. Indeed, one was located near Annunciation Parish and that may help to explain why he was appointed pastor here rather late in his career. Federal housing policy changed greatly in the 1960s. No longer were massive projects built to segregate the white and black poor. Federal funds became available for non-profit organizations, including religious ones to organize and run apartment complexes for older individuals. Throughout metropolitan Detroit, there are now a variety of housing facilities for the elderly supported, in large part, by federal housing funds administered by religious groups.